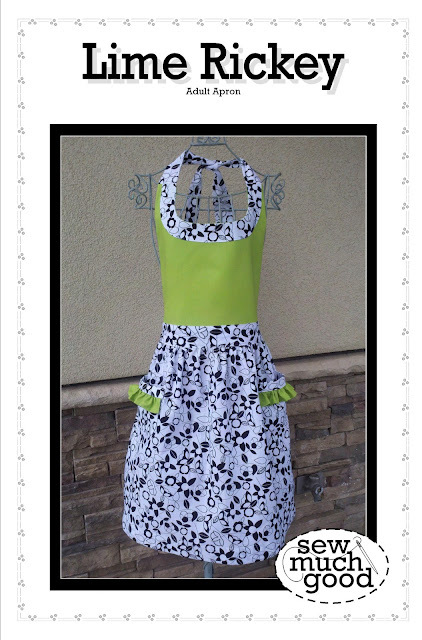 Gigi's Thimble: Finished Apron and Giveaway! Apparently I have been in a non-quilty mood lately! This is the second apron I've made in the last few weeks and I feel like I stretched my beginner seamstress skills with this one. It felt kinda good! You'll have to please excuse the lame picture though. Although I am excited - you might be able to tell that I feel extremely awkward having my picture taken for all of YOU to see?!? I love the girly waistband and the full skirt and these darling pockets. I also love the scoop neck. There are lots of fun little details on this one! This pattern is called Lime Rickey and was designed by my good friend, Eva Garlick from the blog and pattern company called Sew Much Good. Eva has so generously offered to giveaway 5 - count that FIVE - of her patterns to my blog readers! All you have to do to enter is stop by her blog, check out her apron and skirt patterns, decide which one is your favorite (that will be the hardest part) and then come back here and leave a comment telling me which one that is! Take a minute to do these 4 little steps and one of these patterns could be yours! Be sure to leave an email address if you are a no-reply blogger. If you are a follower of my blog, A Little Bit Biased - leave another comment saying "A Little Bit Biased". If you're a follower of Eva's blog, Sew Much Good, you can leave a third comment saying "Sew Much Good!" This giveaway will end Thursday night. The winners will be announced Friday morning. Good luck! Love the Punch and cookies apron- very cute! And I'm a follower of A Little Bit Biased! Thank you for the chance. It looks like a great pattern. Hi Amber! I am so envious of Eva's talent with smocking! I love her Lime Rickey pattern, though would probably do it in the colours of Punch & Cookies. :-) Thanks for the opportunity to win a great pattern! A Little Bit Biased follower - Yay!! I like her strawberry licorice! I love them all, and their names but if I have to pick just one I will go with Punch and Cookies. I yes, I follow A little bit biased. I love the lime rickey one in black, white, and lime! Very modern! OK. Seriously, Lime Rickey is my favorite, but Punch and Cookies is a lot of fun, too. Lime Rickey is my favorite, too. But I would love Punch & Cookies on a little girl. I love the Lime RIckey pattern most of all! Your fabric choices are great, too! How adorable! I don't like having my picture taken either. But you look great and so does that apron! I just went to her blog...sew lovely! I think my favorite apron is Punch and Cookies! I love her punch and cookies pattern. Thanks! I'm a follower of A Little Bit Biased! Lime Rickey is my favourite! Loved Punch and Cookies and started following your friend's blog! I have turned into an apron feign! I love to wear them all day long but especially while I cook. I love the Punch and Cookies pattern. It is adorable! Thanks for showing your apron. A Little Bit Biased, thanks! I think Lime Rickey is my favorite, but Punch and Cookies is really cute too! And the little girl skirts are adorable! You're right it is hard to choose! I think Lome Rickey is my favorite but the other two are close! I follow A Little Bit Biased. Lime Rickey is my favorite and your apron turned out so cute! LOVE the Lime Rickey. Too cute! Lime Ricky is my favorite! How can you not like Punch and Cookies? So cute! Little Bit Biased - I'm a happy follower! Strawberry Licorice is my favorite! I love the strawberry and licorice pattern. I like Strawberry Licorice the best! It's super cute. The Lime Rickey is so cute! I really like Lime Rickey with Eva being a close runner up. and I think your apron is ADORABLE! Love your apron~ I think Lime Rickey is my favorite. :-) Thanks for the fun! I love Punch and Cookies. It's darling. Lime Rickey has to be my favorite. They are all cute patterns--the way that they look like dresses, but my favorite is the Lime Rickey. I follow your blog "A Little Bit Biased" - thanks for another entry!! I love the punch and cookies pattern. Your apron looks wonderful. Great job. I love the Lime Rickey the best. They all are adorable though! Punch and Cookies is my fav. Thanks for the giveaway. After looking over all the patterns I vote for the Lime Richey. My second choice would be the Christmas Gift Tablerunner. Punch and Cookies is just so cute! Thanks for sending me over to her see her great patterns. Love all your projects and thank you for steering meto Urban Threads. What a delightful blog! Thanks for sharing your projects. I love the Lime Rickey apron. Cute. Very Cute! I love the Punch & Cookies apron pattern! I love the Strawberry Licorice apron pattern! Turned out cute! Glad you enjoyed making it so much. You are going to have a gorgeous collection of aprons. I think the Punch and Cookies is my favorite , so cute! Good morning they are all lovely but I really like strawberry licorice and punch and cookies they are adorable. A little Bit Biased follower here. A Little Bit Biased. I am a follower. All of her patterns are so cute, but that Lime Rickey is my fave. Thanks for a chance to win! I love the strawberry licorice pattern. Thanks for the opportunity on the draw. "A little bit biased." I am a follower. Thanks for the opportunity on the draw. I love the Lime Rickey apron. I've had you on my blog list for quite a while now but now I'm officially A Little Bit Biased follower. I love the Lime Rickey...and your blog. I Love the Lime Rickey! But they are all so cute! I am A Little Bit Biased too. Following A Little Bit Biased. Nice spring -like aprons! Hi- the pockets in the Lime Rickey pattern do it for me! Hi, what a great fun give away and soooo generous. What a job to decide though, you were so right on that...but I am going for Lime Rickey, I feel I could wear that and feel grand in it, I know the others are really really pretty but maybe they would get 'stolen' by my daughters....hahaha. Good luck everyone. Saving you and your friend Eva's blogs to my favourites. Looking good in that apron. I thought it was a dress. I just love that little boy Beep Beep quilt. Punch and cookies for me. Hard to choose but I think Punch and Cookies is my favorite. A Little Bit Biased! And love it! I really like the LIME RICKY pattern. It is really fun. My favourite pattern is Punch and Cookies. I follow "Sew Much Good" via GFC. I like Lime Rickey - the one you made.